"I want to transfer songs from my iPod to iTunes. I don’t get why apple make it so complicated!!!! My sister has all our songs on her iTunes and has forgotten the password and can’t get into email so I can’t authorize my computer! Anybody knows a simple way I can easily transfer songs from iPod to iTunes (without downloads.) Thanks!" Have you met such an inconvenience that there is no way to extract music from iPhone to computer? Are you fed up with iTunes, which doesn’t allow an option to copy music from an iPhone to a new PC or Mac computer? Now in this guide, we will introduce you 2 easy and fast ways to transfer or extract music from your iPhone back to computer without losing any existed data. Leawo iTransfer is top-rated software that provides comprehensive solution to transfer different kinds of files like songs, movies, TV shows, contacts, etc. between iOS devices, iTunes and computer. It can also be used to back up iPhone documents to computer and iTunes. 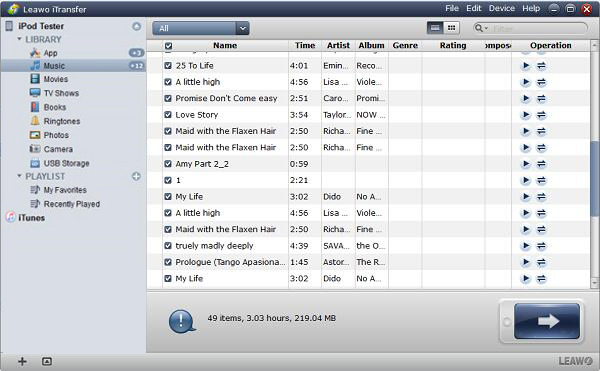 When you want to move music from iPod to iTunes, Leawo iTransfer will help you a lot, for it can transfer all kinds of music on your iPhone, purchased or non-purchased. Download and install this iTransfer on your computer. The following guide will teach you how to import music from iPod to iTunes within 3 steps. Launch Leawo iTransfer and plug iPod to computer with USB cable. iPod will be automatically detected by the software and you can see iPod library in the left sidebar. Go to iPod > Library > Music and all songs on iPod shows in the right interface. Hold "Ctrl" and click songs you want to transfer. Afterwards, right click one of them and choose "Transfer to > iTunes". A dialog will pop up and tick "Transfer to List: iTunes". After that, tap on "Transfer Now" to start to move music from iPod to iTunes. A percentage bar will show you the process of transferring. After the software transfer songs from iPod to iTunes, you can enjoy those songs on iTunes. SharePod is a super easy-to-use music transfer app that enables users to move songs, videos, podcasts, etc. from Apple devices to computer and into iTunes. When you want to transfer songs from iPod to iTunes, SharePod has a say. 1. Open SharePod and connect your iPod with computer. The software will automatically scan songs on your iPod. 2. Click the drop-down box "Transfer" at the bottom and you can see some options. In this case, you can choose "Auto-transfer everything to iTunes", "Transfer current playlist to iTunes" and "Transfer selected tracks to iTunes" based on your need. 3. 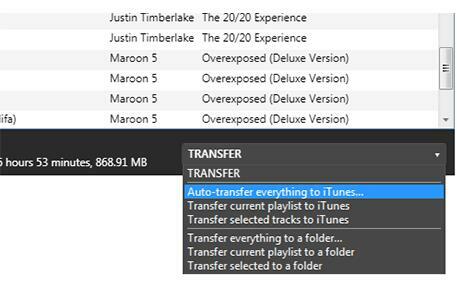 If you want to transfer all songs, you can choose "Auto-transfer everything to iTunes"; If you want to transfer selected songs, you have to first click "Ctrl" and tap on songs you need to transfer and then choose "Transfer selected tracks to iTunes". After that, you can check songs in iTunes. 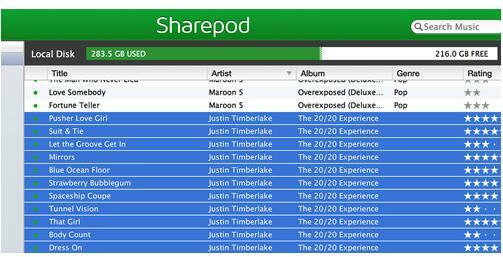 Please note that SharePod only transfer songs you don’t already have in iTunes. iTunes enables users to sync apps, music, movies, TV shows, podcasts and photos with Apple device. However, it only allows you to transfer purchased items from iPod to iTunes directly. If you want to transfer non-purchased item, then you have to try another method. Now I would like to show you how to import songs from iPod to iTunes. 1. Open iTunes and make sure it is the latest version. 2. Insert your iPod to the computer and then iTunes will detect your iPod at the upper right corner. 3. Go to File > Devices > Transfer Purchases from "iPod". After that, it will start to transfer songs from iPod to iTunes. 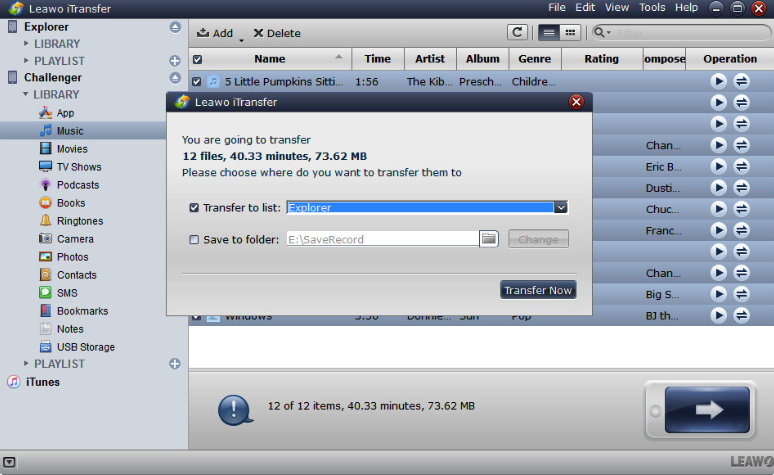 Compared to SharePod and iTunes, Leawo iTransfer supports to transfer multiple iPhone files like songs, photos, contacts, books, ringtones, etc to iTunes and computer. 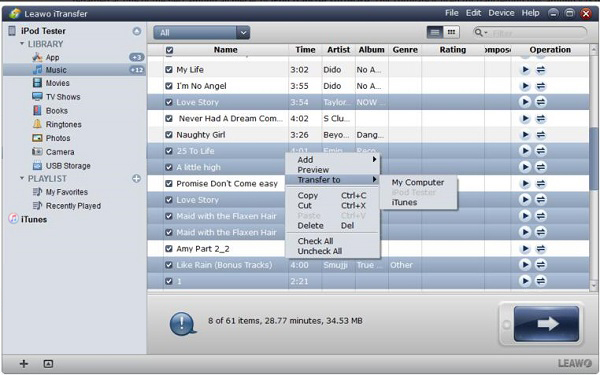 It also allows users to transfer purchased and non-purchased contents from iPod to computer/iTunes. If you are looking for a way to transfer songs from iPod to iTunes, Leawo iTransfer will be a good choice for you to learn how to import songs from iPod to iTunes.